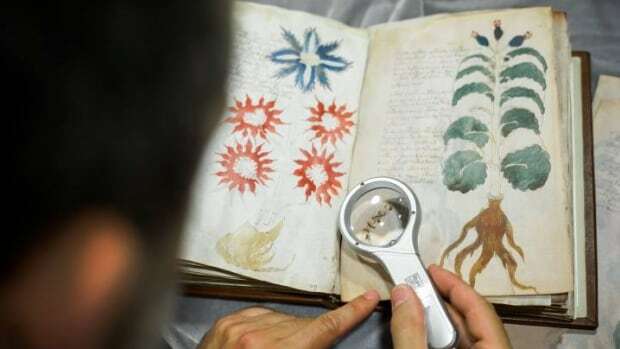 The so-called Voynich Manuscript, a small unassuming book usually stored in a Yale University vault, is considered one of the most mysterious books in the world. "She made recommendations to the priest ..."
And that, mysteriously, is the start of an enigmatic medieval book that has baffled experts for generations — at least according to the Edmonton computer scientist who believes he's cracked the baffling code of the Voynich manuscript. "Once you see it, once you find out the mystery, this is a natural human tendency to solve the puzzle," said Greg Kondrak of the University of Alberta's renowned artificial intelligence lab. "I was intrigued and thought I could contribute something new." The Voynich manuscript has been carbon-dated to the early 1400s. It is thought to be some kind of document on women's health, but because it is written in an unknown language, in an unknown script, scrambled by an unknown code, no one can say for sure. Its 240 pages, now part of Yale University's Beinecke collection, are heavily illustrated with plants, stars, planets and bathing women. Some plants match known species; some don't. Some astronomical diagrams look like zodiac signs; some don't look like anything from earthly skies. At least eight would-be translators have declared success but were later debunked, the most recent of them late last year. The manuscript even frustrated the famed cryptographers of Britain's Bletchley Park, the team that broke the Nazis' Enigma codes. Kondrak thought powerful artificial intelligence programs could help. His university's labs had already developed software that made world headlines by beating professional players at Texas Hold 'Em, one of the most complex types of poker. "The first step is to try and find out what the language is." Its complete first sentence, according to computer algorithms, is "She made recommendations to the priest, man of the house and me and people." The first 72 words of one section yield translations that might fit in a botanical pharmacopoeia: "farmer," "light," "air" and "fire." "I don't think they are friendly to this kind of research," he said. "People may be fearing that the computers will replace them." But Kondrak said there's much more to translation than feeding the Voynich into a computer. A human is needed to make sense of the syntax and intent of the words. "Somebody with very good knowledge of Hebrew and who's a historian at the same time could take this evidence and follow this kind of clue. Can we look at these texts closely and do some kind of detective work and decipher what can be the message?" "One of our motivations was the ancient scripts. There are still ancient scripts that remain undeciphered to this day."